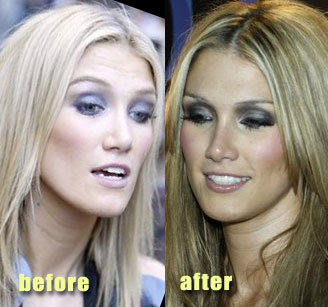 Delta Goodrem before and after nose job plastic surgery. Delta Goodrem is an Australian singer-songwriter and actress who has seen her fair share of success in the early stages of her career in show business, which is why it was even more surprising to see that she opted for plastic surgery. Paris Hilton before and after nose job? As you can see Delta Goodrem had a fabulous God given nose to begin with, however recently shes revealed a new shaved down, much thinner sniffer. Um. You do realise the first photo was taken in 2008 at the VideoHits in Sydney and the ''After" was taken in 2007 at the red carpet for cosmopolitan magazine.. Get your facts straight. Does it matter? She's an adult who can do whatever she wants with her body. She looks great.